Today I declared that is was Operation Clean OUT the garage! 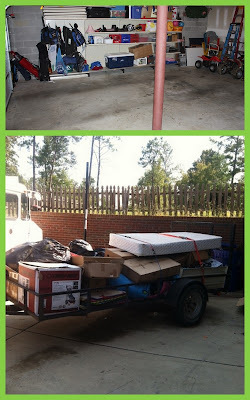 I actually took a before picture but I am too vain to show it to you... so you get to see the top picture which is what it looks like now... wonderfully CLEAN and ORGANIZED and the bottom picture is the trailer FULL of STUFF/JUNK from the garage that we took to the DUMP!!!!! I told RP that if we had not used in then last year it was GONE!!!!! I LOVE cleaning stuff out and throwing things away!!!! We literally cleaned out every inch of the garage and it took us 8 hours from start to finish... that is starting to clean out until we returned from the dump. I can say we were whooped that night and the next day but it feels and looks SO GOOD!!! !